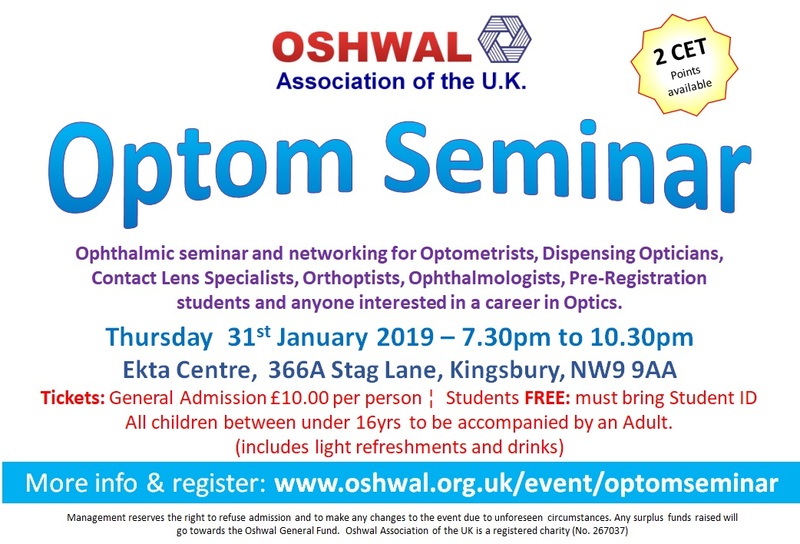 Optom Seminar 2019 | Oshwal Association of the U.K.
Ophthalmic seminar and networking for Optometrists, Dispensing Opticians, Contact Lens Specialists, Orthoptists, Ophthalmologists, Pre-Registration students and anyone interested in a career in Optics. Rudrika Joshi-Borrel has been practising Orthoptics for 10 years and has experience in working with special needs patients, trauma, Thyroid clinics and complex adult motility cases. Rudrika is an intravitreal injector, working in the macular clinic and has experience in interpreting OCT’s and carrying out slit lamp examinations on patients with diabetic macular oedema, AMD, BRVO and CRVO. Rudrika manages the vision screening service in Barnet, providing screening to all government schools in Barnet, as well as being the lead paediatric clinical tutor at City University for the Paeds/BV module for the final year students. Prashant is an optometrist with postgraduate diplomas in Ophthalmology and Clinical Optometry and currently works in a high street multiple practice. He has worked in a variety of different optometric areas including a private laser refractive surgery clinic, hospital eye clinics and training final year undergraduate optometry students. Yashita is an experienced optometrist and currently works in independent practice with a particular interest in Orthokeratology, OCT and Dry Eye Disease. She holds a postgraduate diploma in Ophthalmology and has worked in many different optometric settings including tertiary eye care. Neha has been a qualified Optometrist for 8 years. She is currently a locum optometrist for the Multiples. Through her career so far she has guided pre reg optometrists, supervised third year optometry students at City University and has been a lead Optometrist for a major high street Optician. Nilma qualified as an optometrist after completing her pre-reg year in 2016. She currently works in a multiple high street practice. She has recently volunteered in an eye camp overseas and is currently a member of a team organising free eye care for the homeless in London. Nilpa is an optometrist who completed a PhD in Visual Neuroscience at UCL Institute of Ophthalmology. She continues to work in both clinical (NHS and private) and research roles in the hospital eye service and also works in a high-street independent optometric practice. She is a faculty member of the United Kingdom & Ireland Society of Ophthalmic Professionals. Please note – proof of age may be required to gain entry. All Children under 16 MUST be accompanied by an Adult.